This is Crazy Climber for the Bally Astrocade which is the second homebrew made for the Bally by Riff Raff Games in the last few years. It's a port from the arcade game developed by Nichibutsu in 1980. In Crazy Climber you must climb the sides of buildings, each having near 200 stories. Each building offers a variety of different challenges and obstacles that make the passage to the top more difficult. 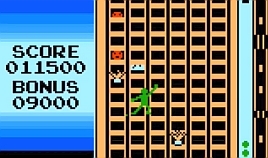 On this upward journey, you will encounter "mad potters", bald-headed scoundrels who open and close windows and drop items to knock Crazy Climber from the building. By hanging on tightly it is possible to protect Crazy Climber from the flower pots, iron dumbbells, bottles and condor excrement. You'd better move fast, because the higher you climb and the more buildings you face, the quicker the pace becomes. The original 2-joystick control scheme has been implimented as well as a single-controller mode. This game had a limited release (50) in the summer of 2011 by Bally Alley. Nice & Games reviewes Crazy Climber!